Thank you to everyone who donated on Saturday, Dec 17 2011 during our 3rd annual Hot Chocolate, Hot Cider, and cookies night. We collected over $670 in cash donations. We also received donations of food, cleaning supplies, dog treats, and more. All donations went to Friends of the Warwick Animal Shelter. Friends does a great job helping the homeless animals by improving conditions, increasing public awareness, providing foster homes, and assisting with adoptions. For more information please see our Donations page. All lights on. 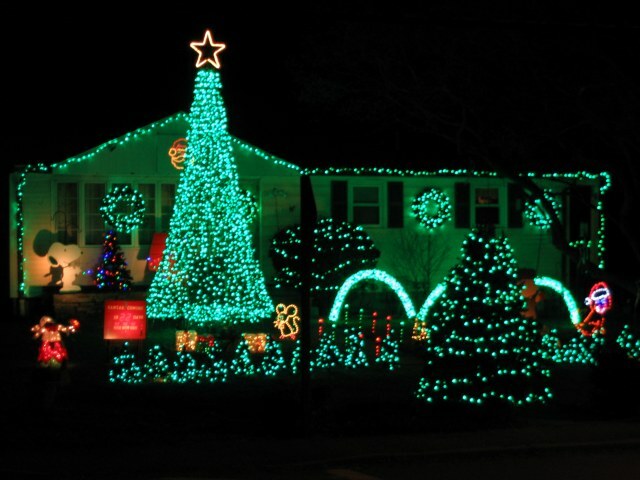 We had about 30,000 lights in our 2011 display. Most are LEDs to provide bright, vivid colors. Most of the display items have 3 or 4 colors allowing individual control of white, red, green, and blue. 272 circuits are used to control the lights by a computer running Light-O-Rama software. The Mega-Tree on the left has 3,200 LEDs of each color. Each color (Red, Green, and Blue) is arranged in 16 segments to allow various rotations and color changes. The star is rope light attached to a wire frame. There are about 50 xenon strobe lights inside the Mega Tree. 50 channels are used to control the lights on the Mega Tree. The Leaping Arches are new for 2011. Each arch has 8 segments with 100 Green and 100 Red LEDs per segment. 16 channels are used on each arch for a total of 64 arch circuits. 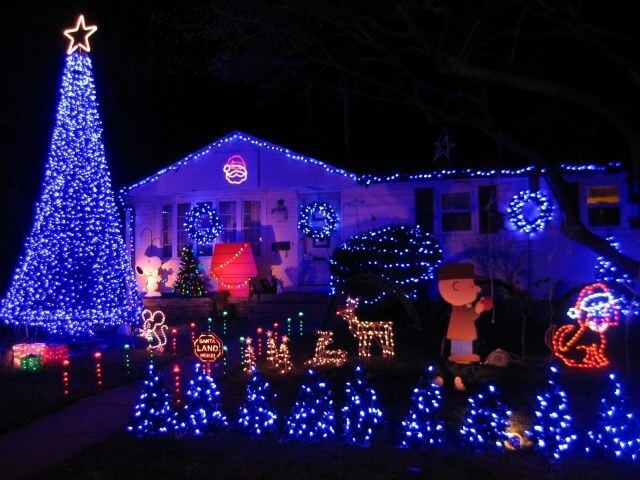 The 4 wreaths on the house each have 100 Red, 100 Green, 100 Blue, and 100 White LED lights. Each color on each wreath is individually controlled. There are 20 mini Christmas trees along the front. Each tree has 50 White, 50 Red, 50 Green, and 50 Blue LEDs. Each tree and each color is individually controlled which allows a wide variety of chases, fades, and combinations. 80 channels are used for the mini trees. 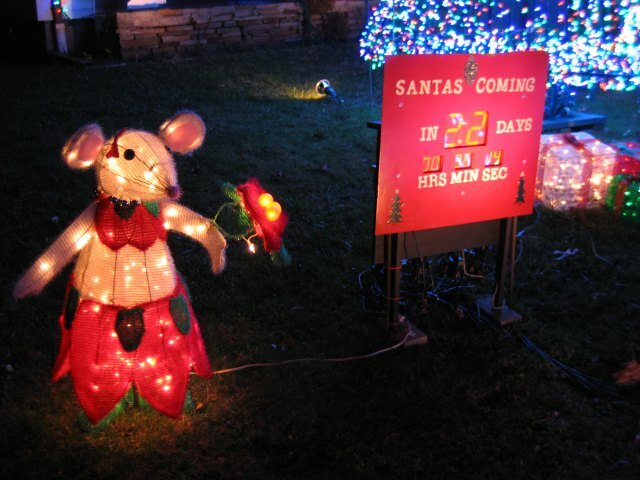 The swaying Hula Rattie and Santa count down sign. Snoopy and his dog house. 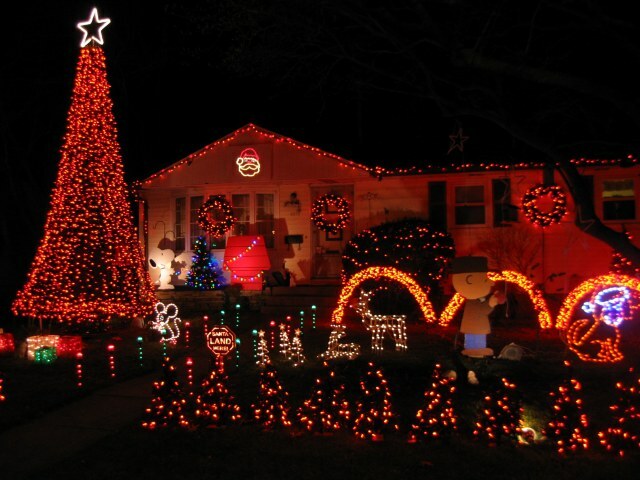 He has gone high tech and is using LED light strings on his tree and house! 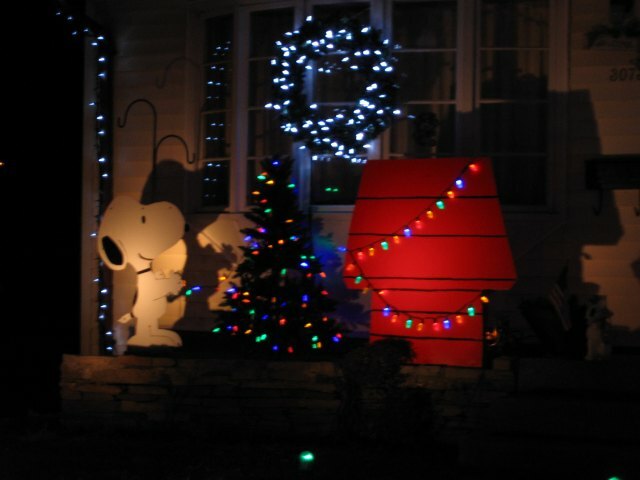 Halogen spot lights are used for some items such as Snoopy and his house. Although they are only 45W spot lights we run them at 40% intensity so they are not too bright. Charlie Brown putting an ornament on his little tree. Flash the Dog is wagging his tail. 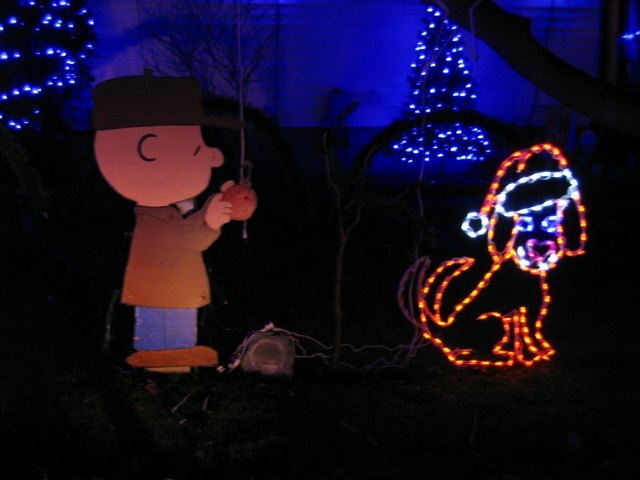 Snoopy is busy elsewhere putting lights on his house and tree.